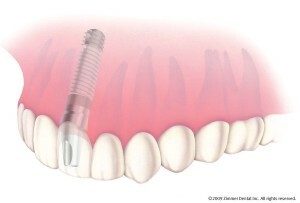 A dental implant is a titanium post that acts as an artificial tooth root. An implant can be used to support an individual tooth or several implants can support a fixed bridge or stabilize a denture. Implants are surgically placed in the bone. Afterwards, a device called an abutment is attached to the implant, which acts as an artificial tooth on which a single crown, a fixed bridge, or removable dentures connect. Depending on your treatment plan, Dr. Kiser will provide you with detailed information regarding the type of dental implant you will be provided as well as the benefits & risks of your unique, individual case. Teeth in a Day Implants (Hybrid Reconstructions) Implants can be used to restore a tooth, replace many teeth or a full arch of teeth! Teeth-in-a-Day Systems are not a gimmick and are actually done. Call (419) 756-2880 to schedule an appointment, or click here to send us a message. Almost anyone can get implants. However some conditions, called “risk factors”, are known to reduce the success rates of implants. In some cases where there is not enough bone to support a dental implant, you may receive a bone graft. Bone grafts are made from real or artificial materials. Where the dental implant is placed affects the success rate. For example, if the ideal location happens to be in the same place as a main nerve bundle, the location must be changed. Location may affect the line-up of crowns or other appliances placed on the implant, causing a higher failure rate. "I highly recommend coming to Dr. Kiser's. He and his staff are absolutely wonderful." Copyright © 2019 Advanced Dentistry & Dental Implant Center. All Rights Reserved.